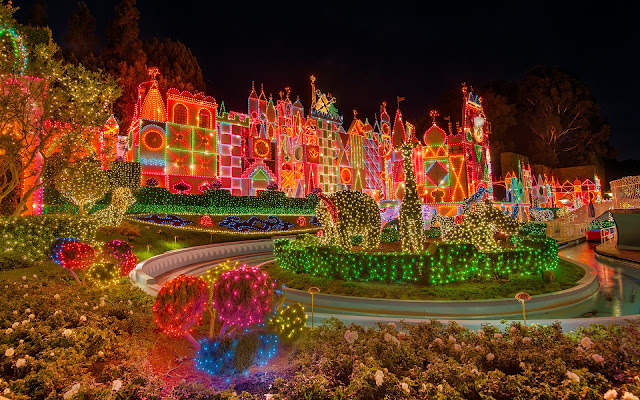 The first time I posted this angle of It's a Small World Holiday Edition several years ago, I had seen it as the Facebook cover photo of Imagineer Steve Davison. At the time, it was a rather unique view on the internet, as I didn't really notice many other photographers capturing it. But with the explosion of DSLR photography and really good amateur photographers, nowadays, just about every Disneyland fan photographer has an angle of the ride from this vantage point. And why wouldn't they? It's a beautiful view, showcasing the brightness and festive facade of behind the turn of the Small World canal flume. Everything about this scene screams Christmas decadence, but it's addictingly charming, and it's become synonymous with Disney Christmas! Colorful, glowing, and full of spirit. It's a Small World Holiday shows the razzmatazz of Christmas!